One of the worst pieces of advice I’ve ever heard came from a trainer who obviously wanted to get rid of a horse. The little girl was five or six. “Oh, buy her a young horse—like this pretty spotted three-year-old,” the trainer told the parents. “That way they can grow up together.” This doesn’t sound like a bad idea—two youngsters bonding?—until you think about it. A 3-year-old is a green horse—and remember, the lifespan of the average horse is about 30 years. This means, there are too many experiences he hasn’t had (getting up close and personal with a cow), too many situations he hasn’t faced (what is that flapping in the tree—a plastic bag, or a Saber-tooth tiger? ), and he’s too young to trust his life to a human. Any human. A five-year-old child can start out with the self-confidence of a movie diva, but that doesn’t mean she’ll stay on if her horse shies at something. Let her keep that confidence by buying her an older horse who won’t shy—or rear, or buck, or run away with her. Most children begin taking lessons around the age of five. But ownership is an entirely different story, and conscientious parents insist on starter pets—a goldfish, a gerbil, a cat, a dog, in that order—and make it clear that taking care of that pet, which includes feeding it, cleaning its bowl or cage and picking up its droppings from the lawn, is the child’s responsibility. If she’s too young to be a responsible dog owner, she’s too young for a horse. It helps if at least one of the child’s parents knows something about horses, especially if the plan is to keep the horse with them, on their property. That way if the horse realizes (and most do, at some point) he can get away with misbehaving—heading straight for the grass growing in the neighbor’s yard, for example—that he couldn’t get away with if an experienced adult were on his back. As to actually buying a horse, it’s probably better if the horse-savvy parent goes shopping by herself. Otherwise she may end up with a totally unsuitable horse just because her daughter fell in love with the first one she saw. Start looking at horses from about ten to fifteen years old. As I’ve said earlier, many horses are fit and sound even at twenty, but after that, vet expenses start mounting up, exactly the way they do with elderly humans. 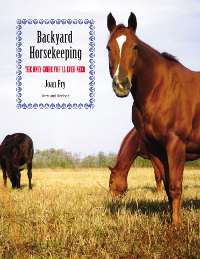 Look for ads that say things like “child-broke” to describe the horse, or “bomb-proof,” or in one case, “husband broke.” They all mean the same thing: this horse is a caretaker. He’s been around a long time and he’s seen all those monsters in the trees and knows they won’t kill him. I would definitely insist on a vet check, officially known as a “pre-purchase examination,” and I would ask what vet the present owner uses—and then make an appointment with another one. This isn’t to suggest that veterinarians can’t be objective. This is just playing it safe. I once thought I wanted to buy a beautiful dapple gray Thoroughbred mare. Her ground manners were terrible (Thoroughbreds are trained to run. Period), and her right front knee was swollen, but under saddle she was fine, and her owner said her children climbed all over her and were safe riding her. Her veterinarian was the same one I used, so I called a vet a friend of mine had recommended. He went over every aspect of that mare. He checked her vital signs, asked what she was being fed, me to walk and trot her away from him and then back to him. He checked her eyes, her teeth, her feet. Then he asked for more walking and trotting. Then he asked what I planned to do with her—turn her into a hunter/jumper? 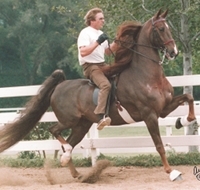 (Most Thoroughbreds jump readily and make excellent show ring hunters or open jumpers.) I said no, I wanted a trail horse. “How long do you intend to keep her?” he asked. “Probably until the end of her life,” I answered. He advised me not to buy her. The bump on her knee was more than a blemish, he said, and he couldn’t guarantee that she’d stay sound longer than two or three years, even if I only rode her a couple of times a week. I didn’t buy her. I bought Prim, instead. Great advice! Love your blog. Definitely bookmarking and coming back often. Thanks Joan! Thank you, Melissa! Good comments, BTW. Thank you–I’m glad you enjoyed it. Good luck with your search.